Chai Wan during Typhoon Haima. Image by Kristy Chan. Hong Kong woke up this morning to a battering from Typhoon Haima. With much of the global arbitration community currently in the city for the fifth annual Hong Kong Arbitration Week, this force majeure event was no doubt an inconvenience. 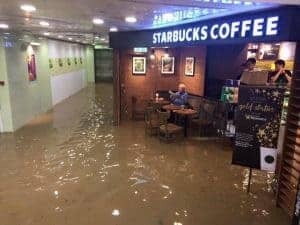 At least coffee was still being served. 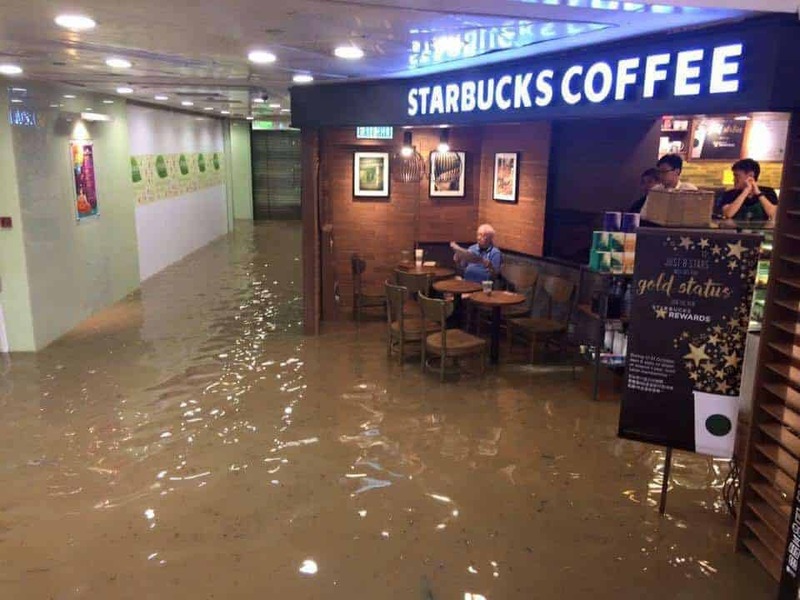 This picture of the so-called “Starbucks Uncle” riding out the storm perhaps reflects, in an unlikely way, why the Hong Kong International Arbitration Centre (HKIAC) was recently voted the most improved arbitral institution, and is one of the most preferred in the world, along with London, Paris, Singapore and Geneva. Hong Kong, this most dynamic of cities, never stops. And neither does HKIAC, with a packed schedule of enlightening seminars and social events, the crown of which is Hong Kong Arbitration Week. Planet Depos’ team of resident staff attended various events this week in the never-ending quest for the most up-to-date knowledge on arbitral practice and current issues facing our industry. Highlights included the Belt and Road Initiatives seminar hosted by the Beijing Arbitration Commission; the energy disputes discussion presented by the Stockholm Chamber of Commerce; and ICC’s insightful dialogue on Rising Asia. The flagship event, ADR in Asia: Arbitration Challenged, was the climax of the week, with panels discussing everything from corruption to transparency, and an entertaining “get to know you” session with newly appointed HKIAC secretary-general Sarah Grimmer. We were pleased to have the opportunity to demonstrate our realtime services to attendees during breaks. The appointment of Allen & Overy partner Matthew Gearing QC as the new chairperson of HKIAC was announced during the week. In 2017 he will succeed Teresa Cheng SC, who has been chair for the past three years. Planet Depos congratulates Mr. Gearing on his appointment and thanks Ms Cheng for being such an inspiring, graceful leader. After a lovely end to the week last night – the glamorous GAR Live dinner – we say thank you, HKIAC, for a brilliant week. 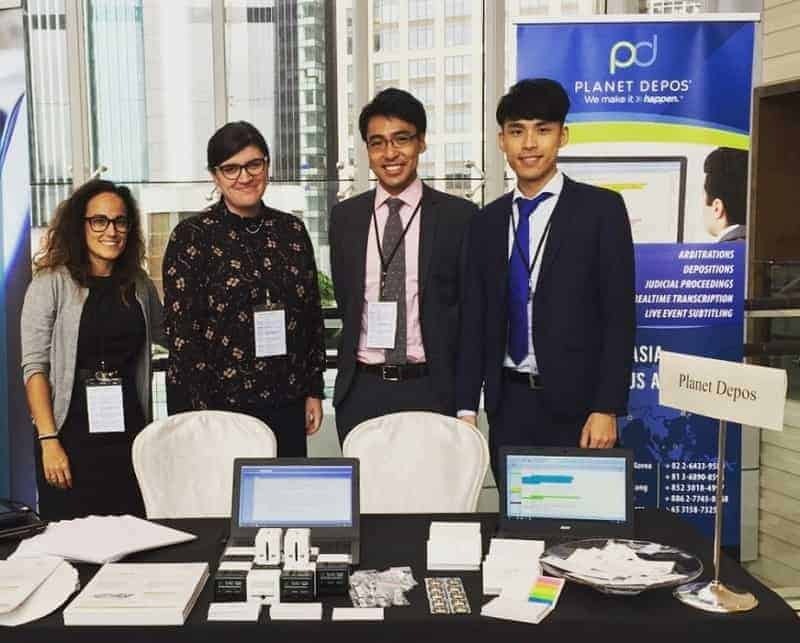 If you missed us at ADR in Asia, please contact asia@planetdepos.com to organise an inhouse demonstration of our realtime court reporting services.